It’s time for another round of MEATLESS MONDAY! I actually sort of get annoyed by the fact that Meatless Monday is a thing, but hooray! We’re there. We’re doing this. This round of meatlessness features the most beautiful, yummy, vegetarian comfort food in all the land: QUESDILLAS! I’m talking about crispy golden brown tortillas wrapped around melted Pepperjack cheese and a spicy lentil and brown rice filling to make my new food love: Quick and Easy Lentil Quesadillas. My sister saw the post title in my drafts folder yesterday and she was like, ummmm WUT are you doing, Sister. Lentil Quesadillas? And I was like, Sister, you don’t even know. Friends, Sisters, Fellow Food Lovers, get yourself on this deliciously easy lentil quesadilla train right now. Don’t be food nervous. We can branch out and put lentils in our quesadillas, right? We most definitely can. Also please note the green sauce ALL OVER THE PLACE. So let me tell you the truth about Meatless Mondays, which is that we actually don’t really do Meatless Mondays. We just do a lot of our meals meatless EVERY day because that’s how I usually like to cook. Somehow, with my small town Minnesota upbringing, some percentage of my soul turned out to be vegetarian, so things that some Sisters might find weird (Lentil Quesadillas, for example) are actually my bread and butter when it comes to easy, fast, weeknight do-able cooking. I honestly don’t know where this love of meatless things comes from. Possibly because the recipes feel healthy, and I think they taste awesome, and I find myself being most creative with non-meat food combinations? Yeah, maybe. Or maybe because sometimes it’s just easier to toss some lentils and brown rice in the crockpot than it is to deal with meat? Umm, well, here’s the thing, it’s just… OKAY YAHHSSS. Totally busted. With that in mind, let’s take a look at how easy this recipe is. I spy a hungry you and a crockpot and some lentils and brown rice… and a weeknight dinner that is yet to be made. Come on guys LET’S DO THIS ALREADY. 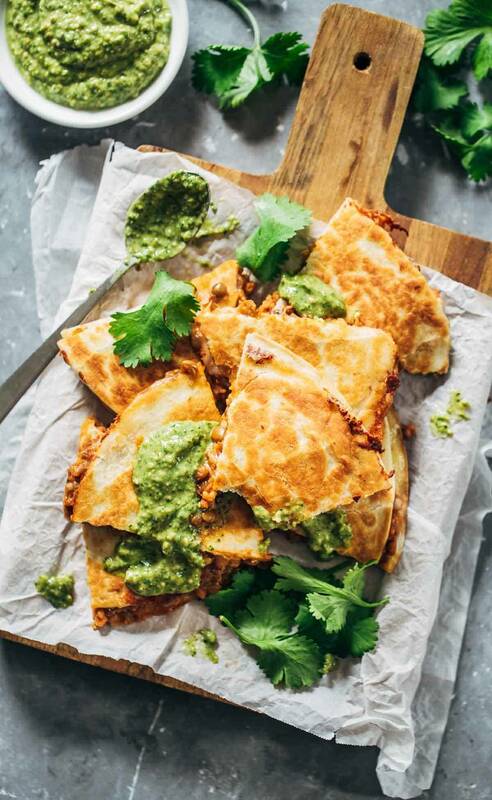 Beautiful, yummy, vegetarian… QUESDILLAS! Crispy golden brown tortillas wrapped around melted Pepperjack cheese and a spicy lentil and brown rice filling! Sauce: Blend all the sauce ingredients together in a blender or food processor until mostly smooth. Assemble: Heat a skillet over medium high heat. Layer the following: tortilla, 1/4 cup cheese, 1/2 cup filling, 1/4 cup cheese, tortilla. Spread the outsides of the tortillas with butter and fry on each side for 3-5 minutes until golden brown. Remove from heat and let stand for a few minutes (they’ll hold together better). Cut and serve! May I suggest topping with Magic Green Sauce? If you have any extra filling, it freezes really well. If you don’t have a blender, just cut the onions and garlic into small pieces and stir all the sauce ingredients together. If you want, you can make this on the stovetop or in a rice cooker. Just simmer or cook until the rice and lentils are soft. It took me two or three rounds in the rice cooker to get the brown rice cooked, so if you want it to be done faster, I’d use white rice. For more spice, add a jalapeño or a chipotle pepper to the sauce! I did that a few times. Yummy. 1) If you have extra filling, it makes for a seriously great freezer standby. 2) My sister Kristin, who semi-made-fun of me for the lentil quesadillas but loves to cook and actually does like lentils, is joining forces with us here on the Pinch of Yum team! And so is baby Charlie! As resident eye candy baby mascot. With more than 700 posts that are live and active on the site, managing comments on all those posts is becoming increasingly difficult for me. In the reader survey, we found that most readers either don’t care about comments or find them primarily useful for recipe reviews and ratings. So for the next few months, in order to free myself up to do more recipe and product creation, we’re starting a trial period with Kristin managing comments on older posts. I will still be commenting on the most recent posts because I love connecting and I don’t want to give that up! But you might see Kristin’s sweet face popping up here and there to answer questions or say hi after I’ve already gone through comments on a post. She’s been the inspiration behind many popular recipes on Pinch of Yum, and she’s also Cutest Mom to my Sweetest Nephew, so I think you’ll love her right along with me. This looks amazing! I love lentil recipes. I have all the ingredients for that easy quesadillas. so, how did yours turn out? no one can hate this recipe. I still have a massive bag of red lentils from my lentil phase. Butternut squash soup with lentils for weeks until I got tired of it. Do you think this recipe would work with red instead of green? Can you substitute lentils for each other? For this recipe, that would probably be fine! Just note that cooking times can be different for different types of lentils. Hope you enjoy it! That’s so funny! I was realizing a few months ago that, though I am not a vegetarian, cooking meatless meals is 1,000 times easier to me. I keep finding that these limitations result in the most creative dishes. Lesson learned: laziness can be the catalyst for invention…and accidental partial vegetarianism… This sounds devilishly delicious! I can’t wait to try! Alright already….I’ll make the green sauce this week! I’m really excited about this post. I made split pea soup yesterday and when I was pulling my canister of split peas out I saw my canister of lentils (and pinto beans and white beans) and thought, ” I really need to work more with lentils”. This recipe looks yummy and I love that you can freeze the stuff. 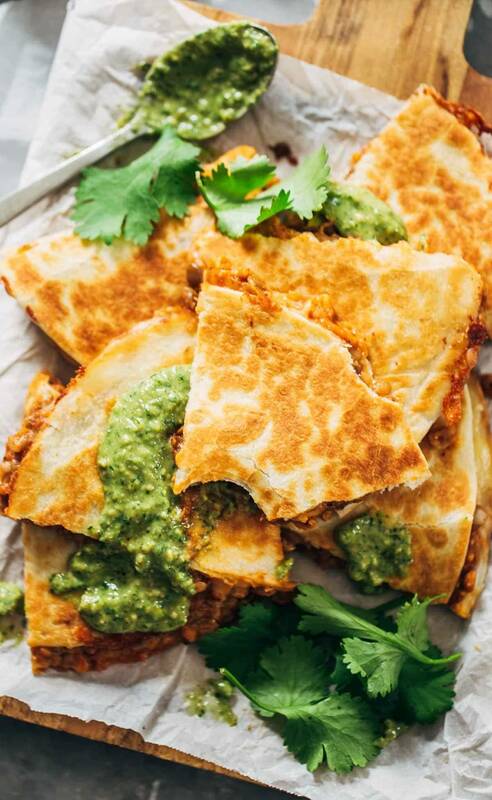 I am LOVING your green sauce and can’t wait to try it smothered on these lentil quesadillas! What a great idea to use lentils in quesadillas. I haven’t tried it but I know I would love it! This would be great for lunch or dinner. Hi! These look delicous!! YUMMY! What is the calorie count for a serving of these? Hey Emily! It took me a little longer to get the label out this morning for a number of reasons, one of them being that it’s really hard to make a label for a recipe with tortillas because there are so many variations! 🙂 but the label’s there now. Hope that helps! Cheers to Lentil Quesadillas and a cutie pie baby mascot! I have a sweet little Charlie too. I have mixed feelings about meatless Mondays, too. On the one hand, it’s a great motivator for people who would otherwise never, ever eat meatless but I definitely think people should feel empowered to eat meatless whenever the mood strikes them, too! Definitely in the mood for lentil quesadillas now. I normally skip lentils because they take too long to cook but crockpot = all of the YES! That is so awesome that your sister will be helping answer older comments. So fun! And Baby Charlie is truly the cutest little guy ever! These look crazy delicious. I LOVE red lentils with cheese. It’s my go-to. Fiber, plus cheese… it’s all about balance, yes? I agree! We are excited to give it a try and have her officially on the team! Never in a million years would I have thought to make lentil quesadillas. I have a huge bag of lentils and can’t wait to go home and try this. Thanks! Can’t wait to try these out! Do you happen to have nutrition facts for the recipe? I didn’t see them where you usually have them at the end of a recipe. You should check out our site. You can enter any recipe you have and we will calculate the nutritional value for you…easy and free! Can you kindly direct me to where on the Pinch of Yum site I would find the nutrition calculator for recipes? I can’t find it. Thanks very much. Hey Ali! Took me a little longer this morning, and it’s a bit harder to get these ones accurate because a lot of it depends on the tortillas, but I have added a label in the post as usual. 🙂 We usually use Food Blogger Pro’s nutrition label generator tool – http://foodbloggerpro.com/tools – hope that helps! Meatless Mondays rock! So do these lentil quesadillas. Did the pooch manage to steal one away from your photo shoot? LOL! Well I took lentils out of my cabinet today hoping to feel inspired to do something with them – it must be fate! I can’t believe I didn’t think of lentils in a quesadilla! Brilliant! Since I’m on a diet right now, gonna hold off trying them…but may be a perfect appetizer for my sons bday party in May! Thanks! I’m always looking for new ways to use lentils. This looks great! I love the sound of it, I love the look of it, I must try this recipe , simple as that ! Okay, I’m gonna need to know how many things your magic green sauce goes with. I just bought the ingredients this morning and it seems as if I may need to go back to the store so I can make VATS of it. Mmmmmmm can’t wait to try it! Yum I love the idea of lentil quesadillas especially as its a meat free recipe still getting your protein hit. I am definitely on the same page re meatless Monday! I just eat meat maybe once every 3-4 days, and the rest of my food is all simple vegetarian stuff like this. No big deal. 🙂 I love the idea of bulking up a taco with lentils! So much faster than cooking pintos from scratch. What type of lentils do you recommend? I once made a lentil recipe from your site in a crock pot and it took 10+ hours for the lentils to cook. Hi, Emma. For this recipe, we recommend using brown or green lentils. Maybe try the crockpot on high to see if that works better for you. Let us know if you have more questions, thanks! Cauliflowerac taco/burrito filling is to die for. Might have to make up a batch and use it in these. Have you seen/tried recipes for a tofu tamale pie? I made it all the time when my kids were little, and no one knew it was meatless. My attempts recently have been abysmal. It contained extra-firm tofu drained and crumbled with spices, fresh/frozen corn kernels, some tomatoey-sauce (not soupy) and perhaps beans topped with a cheesy cornbread mixture and baked. Some won’t eat tofu though I still use it occasionally. No I haven’t tried a tofu tamale pie! WHAT. Love the idea! You are a crockpot genius! I can’t wait to try out this rice and lentil number on my crockpot. I’m just envisioning all the possibilities! Yay! Kristin is the best. I’m not even biased or anything.